Denny’s—where I spent many a high school evening drinking coffee, eating Super Birds and smoking in the back room because there was nothing better to do at night—are scarce around NYC. The nearest location, 20 miles away, just happens to be in my favorite part of New Jersey; the region that’s also home to Bud’s Hut and the Linfield Inn. I took this as a sign. But before heading out to Avenel to finally experience Baconalia (I don’t only wait for hotspots to have a month-long cool-down period) I was warned about restaurants defaulting to imitation bacon. No way, not at Denny’s. 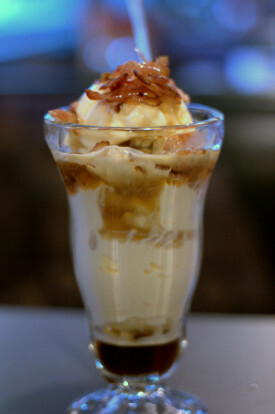 The Maple Bacon Sundae was not a purist affair, however. The bacon crumbles, more fatty than crisp, as I like them, were real all right, but the scourge of diners everywhere: maple-flavored syrup, a.k.a. corn syrup followed by high fructose corn syrup on the ingredient list, was the amber imposter drizzled atop and pooled at the base of the vanilla ice cream tower. Despite the unnatural sweetener, this was not a bad sundae. The spoonfuls of melting ice cream striped with syrup and smoky nubs of pork were welcome sweet-salty blasts; the only thing that could’ve upped the ante would have been a sprinkling of chopped hickory-smoked almonds. I still had to admire Denny’s moxie. Sure, bacon desserts are old hat to food trend followers (though it’s a faster trickle-down than craft beers now appearing at T.G.I. Friday’s) but that doesn’t mean the average customer is necessarily ready for the meeting of sweet and salty in soda fountain classics. The disgust and outrage overheard at a nearby table might’ve been initially mistaken for the matrimonial union between two men. I did not hear her response. Perhaps, she’ll now finally be able to say that she’s seen it all. I hope she’s already watched Nannerpuss.